For a vacation that will renew your vigor, reset your internal clock and put you in touch with the commanding natural beauty of coastal Maine, there’s no better choice than to sail aboard one of Maine’s Windjammer Fleet. As a travel writer, I’m frequently asked, “What’s your favorite trip of all time”? 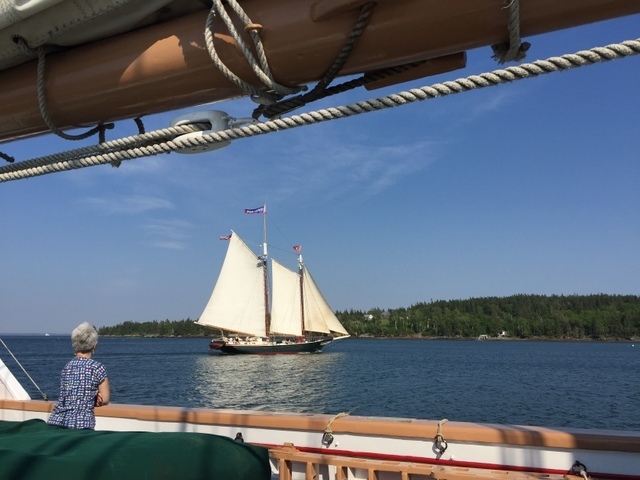 It surprises many to hear that sailing the coast of Maine aboard an historic wooden windjammer ranks at the very top of my list, and there are so many reasons why! Just reminiscing about the experience brings a smile to my face. 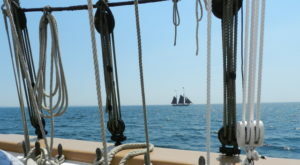 If you’ve never considered a sailing vacation aboard one of the 9 schooners in the Maine Windjammer Association fleet, you’re missing one of life’s great adventures. Let me set the stage. The sea is mirror calm as dawn coaxes away a lingering morning fog. 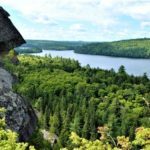 A gentle breeze lifts puffs of gossamer mist to reveal Penobscot Bay with secluded coves, granite promontories and dozens of pristine islands populated only by towering pines. The smell of freshly brewed coffee and muffins still warm from the oven beckon me to shake off sleep and start another remarkable day aboard the three masted schooner, Victory Chimes, largest historic sailing ship in the Maine Windjammer fleet. With no cable news, no cell phones ringing, traffic blaring or dogs barking, there’s nothing to do but gaze at the horizon over my steaming mug and wonder what sailing delights this day will bring. Life aboard Victory Chimes falls quickly into a comfortable rhythm. Our cabins are cozy but have headroom to stand, a porthole window, sink with hot and cold water and electrical outlet. We are lucky enough to have a private head as well, but there are ample facilities throughout the ship for those who don’t. Decks are wide with plenty of cushioned benches for sitting to swap tales and gaze out to sea. 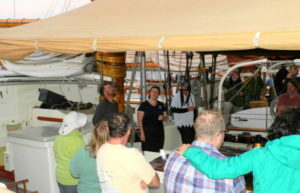 The ship sails with up to 40 passengers and a crew of 9, so there are always helping hands when needed. A delicious breakfast of fresh fruit, stacks of blueberry pancakes, bacon and sausages assures we are ready for some exercise and to hoist the sails. Ready on the throat? Ready on the peak? Heave…HO….heave…HO…..heave HO! Hand-over-fist the sails are quickly set and we’re off chasing the wind to a destination that reveals itself to Captain DeGaeta based on the prevailing winds and weather. “Mind that swinging pulley or you’ll be a…BLOCK HEAD!”, cautions First Mate Dave, with a smile on his face. 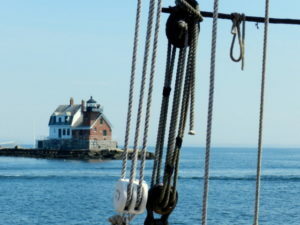 We’ve left Rockland harbor behind, sailing on calm waters past the iconic Rockland Breakwater Lighthouse, past the grand windmills of Vinalhaven, and are heading for a quiet bay where the windjammer fleet can gather for their annual “GAM”. 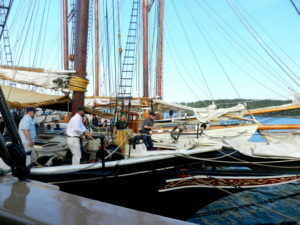 Gam is an old whaling term for a gathering of ships, and tonight the Maine Windjammer fleet will raft-up for a grand party at sea. Imagine, up to nine Tall Ships tethered together to celebrate the beginning of the summer sailing season in Maine, just pinch me! The sight of 5 wooden schooners, all on the National Registry of Historic Places, can’t be duplicated anywhere else in America, and we’re thrilled to be sailing on the largest and last surviving wooden schooner of it’s type. The windjammer fleet comes together on six occasions during the summer sailing season and it’s always a spectacular show when they do. I can’t help but think of the thousands of people who buy tickets for “Tall Ships” events around the country, for just a glimpse of these majestic ships. And here we are, a lucky few, who have our own private tall ship extravaganza. 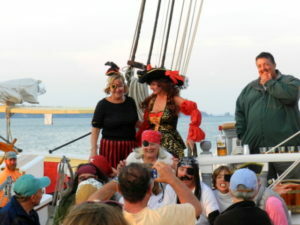 This night, 7 schooners tie up together and the party begins with lobsters, music, costumes, ship hopping, and dancing on the decks; all topped off with a spectacular sunset – magical. Our five days sailing aboard Victory Chimes is punctuated by wildlife sightings that can include seals, osprey, eagles, dolphin, whales, and sea birds of all description. We frequently watch lobster boats at work hauling traps and sorting their catch. The parade of uniquely shaped lighthouses is fascinating and there are opportunities to explore the quaint coastal fishing villages we pass; far more accessible by sea than by land. Evenings are spent gazing at the stars (so bright undimmed by ambient city lights), reading, playing cards and impromptu musical performances by talented crew and guests. Even though I’ve brought a thick novel to read, you’ll most often find me perfectly happy to gaze over the rail at the changing landscape and chat with fellow passengers. 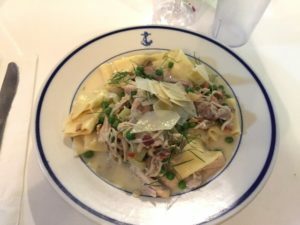 Will I get sea sick? 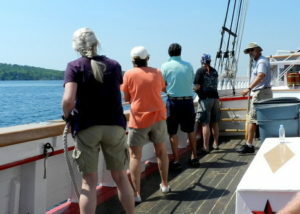 – Unlikely, you’ll be sailing in the usually calm waters of Penobscot Bay which is dotted with 3,000 islands. You are not in open ocean and there is always land in sight. You will have opportunity to go ashore for a walk most days as well. What are the cabins like? Cabins vary from ship to ship, but generally speaking are just large enough for your bed and a sink – bring duffle bags for luggage to slip under the cots. Dress is very casual – I liken it to indoor camping with catering. What if it rains? Well sure, that happens, but Captains try to steer clear of storm clouds and there are tarp awnings that can cover most of the deck. And that’s when all the board and card games come to life below deck. The basic rule is to dress in layers so you can add and shed layers as weather changes. Can I bring my favorite beer or wine aboard? Of course, and there are coolers on deck to store them. We found that boxed wine worked great. You’ll also have opportunities to purchase beverages on your shore breaks. Will I be comfortable with the other passengers? The vacationers we have met on windjammer cruises are some of the nicest and most interesting folks we’ve met in our travels. Everyone has come to make friends, swap stories, and appreciate the unspoiled beauty of coastal Maine. Most ships welcome adults and well behaved children over the age of 12, which can vary by ship. 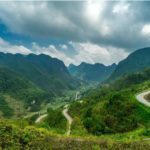 This is a great choice for solo travelers. Is the food good? Ship-made and DELICIOUS! You’ll be astounded by the variety of dishes that emerge from those compact galleys. You won’t go hungry morning, noon, or night, and will likely be begging the chef for his recipes before you leave. Since the kitchens are provisioned from local markets and from the sea, everything is fresh. 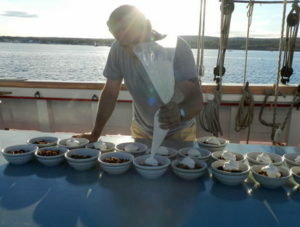 Just let them know about any dietary requirements when you book your sail and the chef will be sure your needs are met. On our final evening aboard Victory Chimes, as we watch yet another spectacular sunset, there isn’t a passenger on board who wants to leave in the morning. As one, we wish this soothing interlude in our lives could stretch on and on. These are halcyon days we will reach for in our memories when the buzz of life gets too much. We are richer for meeting these dedicated captains and crews who preserve and celebrate the golden age of sail in America, and who share the experience with fortunate vacationers. 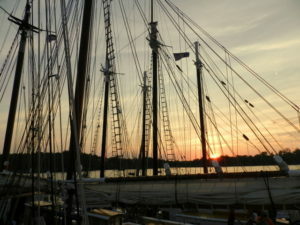 For more information about the Maine Windjammer Association and all the ships in the fleet (and to order a brochure), visit SailMaineCoast.com. 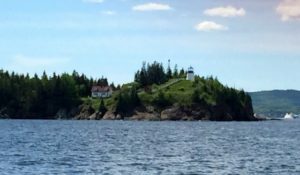 There are many specialty cruises throughout the summer ranging from guest musicians, kayaking, lighthouses, photography, wine and beer tasting, and fall foliage to name a few. Cruises range from 2- 10 days and sail from May to mid-October from their home ports in Rockland and Camden Maine. For me, I’m already dreaming of when I can sail again next summer!